If you're looking for a book that will stir up your emotions, read A Fine Balance by Rohinton Mistry. Set in India during the 1970s it tells the story of a lonely widow, a homesick college student and two tailors seeking work in the city. Each character is struggling with their own misfortunes, in particular the two tailors whose experiences of hardship and loss are heartbreaking. A Fine Balance highlights the fine line that exists between hope and despair. It's about love, hope, sorrow and our capacity to pick ourselves up when bad things happen and carry on. Mistry also provides a fascinating yet unsettling insight into 1970s India including the caste system, slum communities, life as a beggar, widespread corruption and horrendous injustices against some of the country’s most vulnerable people. 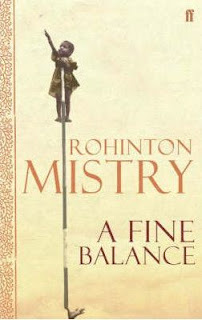 While it might sound heavy going, Mistry writes in a manner that very easy to read, tempering sadness and brutality with compassion and humour. This is a very powerful book and a hauntingly beautiful read. I read it while I was travelling in India and it had quite a profound effect on me. One of my favourite characters in the book is Shankar, a homeless beggar with no legs or fingers who gets around on a small wooden platform with wheels. At the same time I was reading about Shankar, I was being approached by beggars on the street just like him. The book was a stark reminder that while our backgrounds and life experiences were worlds apart, each beggar had their own hopes, fears and dreams, just like me. The distance between us wasn’t so great after all. Thank you to Matt for recommending this book to me. *Please note: You won't pay more if you purchase via this link, but they will give me a small referral fee (5%). Would you like to receive news and interesting facts about books from around the world? If so, follow me on Facebook here and on Twitter here. Hi Carole, yes I would love to - I will check it out. You just sold me on "A Fine Balance". I have wanted to read this for a very long time and have no idea what is holding me up other than all the other books on the tbr list. I am choosing this for one of my book clubs. Thanks! Hi Jenn, that's great to hear. I hope you enjoy it as much as I did - happy reading! The Reading Experiment is back!